This is my favorite time of year. The sparkling lights, cookies baking, friends gathered. The wonder and holiness of God becoming feeble babe. It’s a miracle. A beautiful, desperate miracle. In my mid-twenties, I began to discover the liturgical church year and was pulled into the beauty of the advent season. There was something that kindled my sojourning heart. The light making the darkness flee. The simplicity and ancient tradition in advent liturgy. Walking in the shadows of saints of old, advent created in me a deeper thirst to know Jesus and see his return I didn’t have before. What is Advent really about? Advent is so much more than a colorful, chocolate countdown to Christmas. It’s a holy mourning, a cry for mercy and for justice. It is a season of repentance and a call to be the hands and feet of Christ. It is remembering the prophets precious promises fulfilled. 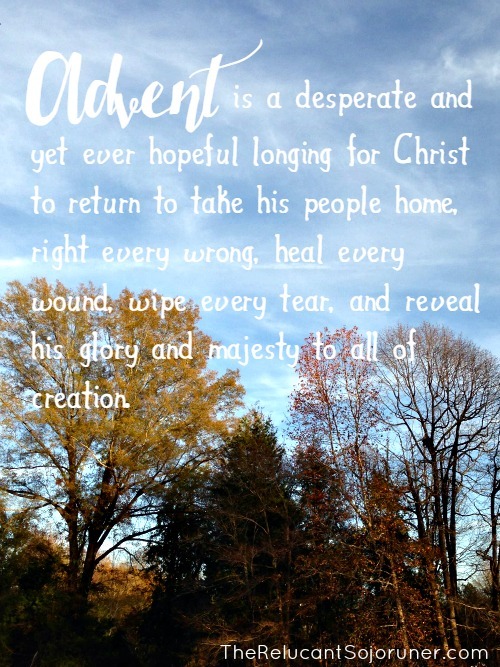 It is a desperate and yet, ever hopeful longing for Christ to return to take his people home, right every wrong, heal every wound, wipe every tear, and reveal his glory and majesty to all of creation. All will know and all will see and every knee with bow. It will be the ultimate jubilee. This advent perspective of Christ’s second coming was so different from how I had heard people talk about Jesus’ return. With their eschatological verbiage they’d dive into the rapture, point out the signs of the times, and analyze whether you’re you post-trib, pre-trib, or amillennial. Discussions were more focused on how and when Jesus was going to come rather than He is coming. There was a fervor for the facts, but lacked a passion for the person. I didn’t see a reason to long for Jesus’ return if it was one big guessing game ending in havoc and chaos. And then I found advent, I met Christ in a way I hadn’t before. He was nearer. He was compassionate and humble. His presence closer, His companionship real. Sorrow had an answer. He was eager (and is!) to meet the needs of his people. He is patient that more would be lead in kindness to repentance. Longing for the second advent gives me a purpose and hope I didn’t have before. There was a promise made long ago and He is that promise. Jesus is ready. Home is on the horizon. He is coming, for now we wait. When we all see Jesus, we’ll sing and shout the victory!